Business is like golf. 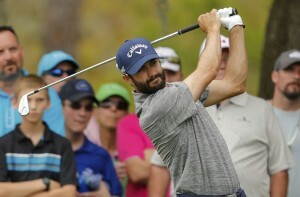 Consider the challenges faced by Canadian Adam Hadwin on the final round of the Valspar Championship on Sunday. This is his third year on the PGA Tour and Hadwin had recently attracted attention with the rare and remarkable achievement of a 59 on a par in California, finishing second and winning his first major prize money of $626,000. Last week at the Valspar Championship in Florida, he had played three flawless rounds and was leading on Sunday by four strokes at 14-under-par. His playing partner in the final group was Patrick Cantlay at 10-under-par and the other challengers were further back. So Hadwin’s strategy was “to just hit fairways and greens” and count on his putter to get him an occasional birdie to retain the lead for his first win on the Tour. He had admitted before starting that staying focused would be difficult, knowing that a win would move him to fourth place in the FedEx Cup standings, give him a two-year exemption from qualifying on the PGA Tour and earn a much-coveted invitation to the Masters in April. He had already committed to getting married in two weeks, but his fiancée, who has been coaching him on keeping calm instead of occasionally ‘losing it’, had already agreed to change honeymoon plans if necessary, to go to Augusta for the Masters. It was a lot to ignore while trying to win his first tournament. So how did his strategy work out? Not exactly according to plan. Patrick Cantlay came on strong and maintained the pressure until the end. He also had a backstory and was out to prove that he belonged among the young American stars of the game, playing only his second event on the PGA Tour. He had been a top-ranked college player and World #1 amateur for over a year, ahead of Jordan Spieth, Justin Thomas, and Daniel Berger, all of whom had surged into prominence on the PGA Tour during his absence of almost three years due to a severe back injury. During that time, he also suffered the tragic loss of his caddie and long-time friend, Chris Roth, who was killed by a hit-and-run driver while walking right in front of Patrick. It was a lot to recover from and get back to playing professional golf at a high level. Cantlay had a run of birdies to reduce Hadwin’s lead to only one stroke after the first twelve holes. Then on the long par three 13th, Cantlay hit it within five feet for another likely birdie to tie for the lead as Hadwin’s ball was lying over 50 feet from the hole. But Hadwin reversed the pressure and drained the putt! Cantlay stroked his ball confidently into the hole for birdie, birdie. On to the 14th for par, par. Hadwin was still leading by one. At the par four 15th, Cantlay hit his approach shot into the greenside bunker and missed the sand save by hitting it well past the hole and needing two putts to come back for bogey. Advantage to Hadwin with another par. He was back on cruise control, “just hit fairways and greens”, with a two stroke lead at 15-under versus Cantlay’s 13-under and only three holes left to play. Surprise! Off the 16th tee, Hadwin hit a wide curving fade into the lake on the right side of the fairway. “I don’t know where that drive came from,” he said later, “after four days without a bad drive.” With a one stroke penalty, a layup and two putts on the green, he left the 16th with a double bogey six. Cantlay had a long drive down the middle and made an easy par four. They were now tied at 13-under. Two pars on the 17th followed by two good drives, left them still tied with no advantage and looking at the 18th green from 150-yards away. Is your business this exciting? Would you be able to focus and make the shot? The pressure makes a difference. Nerves jangling, adrenalin pumping, a caddie offering advice and surrounded by excited spectators. Don’t think about winning or losing, or the consequences. Not the $450,000 difference in prize money between first and second, not the FedEx Cup standings or the two-year Tour qualifying exemption and not the invitation to play at the Masters. Just make the shot. Hit it close and one putt to win or maybe two to continue in a playoff. Forget all that. Just focus. Make the shot. Cantlay was first. He hit it slightly right of the green and his ball rolled down the slope and into another sand trap. Hadwin hit his ball to the middle of the green, but it rolled to the back across the fringe and up against the longer grass. More challenges for each golfer. Cantlay again failed to hit it well out of the sand and this time it stopped short, leaving a fifteen-foot putt for par. Hadwin decided to hit through the grass with the blade of his wedge on the centre of the ball. The commentators agreed it was the right technique for the awkward lie, but difficult to execute, especially under the pressure to get it close to the hole. Still calm and confident, Hadwin hit it perfectly and rolled the ball to within 18-inches. Cantlay missed his putt and Hadwin finished with a par to win. Happy honeymoon! Easy to make new plans with the $1.1 million in prize money. You can extract the lessons that suit you from this dramatic round of golf, but Cantlay learned he has to improve his play from the sand traps and Hadwin reinforced what he had already demonstrated with his round of 59. Stay calm and confident, focus on the task right in front of you and block out the distractions. Good strategies for your business too, don’t you think? Check out Uncle Ralph’s books, Don’t Do It the Hard Way and The Complete Do-It-Yourself Guide to Business Plans. Available online or at your favourite bookstore in hard cover, paperback or e-book.